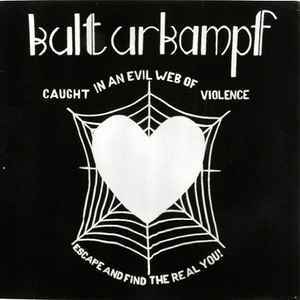 Kulturkampf (2) ‎– Caught In An Evil Web Of Violence - Escape And Find The Real You! Tracks A1 to B2 taken from their "The Corpse Of Democracy" 2nd Demo from 1983. Tracks B3 to B5 taken from their "The Struggle" 1st Demo also from 1983. Track B6 recorded Live @ Haddon Hall, Leeds, on July 24th, 1984. Remastered @ AOK Studios from ancient cassettes in 2006. PLEASE NOTE: Items are also listed for sale elsewhere or are sold at gigs/record fairs. On very rare occasions an item listed here may have been recently sold and may not be available. Postage on flexis is free if ordered with any other records. Double records count as two records for the calculation of shipping prices. New. Some slight shelf wear and minor creasing on sleeve.